The Special Operations Drop Holster is designed to take a pistol with either white or red dot sighting system and a spare magazine. 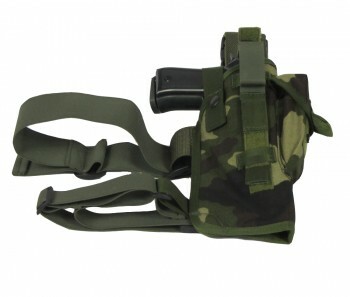 The Special Operations Drop Holster is designed to take a pistol with either white or red dot sighting system and a spare magazine. It also features a double security system, ie Thumb-break and secure strap (removable) and is designed for use as a thigh mounted system.